786 Cosmetics is a brand that has launched just for you. Whether you’re out here trying to make a statement in the fashion world, or just trying to make your life easier with their breatheable nail polish, 786 Cosmetics is practically tailored for you and your needs. We sat down with Taylor from 786 Cosmetics as she told us all we needed to know about their brand; from its launch to its creation all the way down to the nitty-gritty science behind it all. Q: Who started this brand and when was it launched? Ibrahim Ali decided to launch his own halal nail polish brand after seeing other companies starting similar businesses but not marketing internationally. Him and his wife, Iqra Isphahani, decided that they wanted to create something similar but for it to appeal to Muslim communities around the world not just in the U.S. After nearly a year of research, planning, and some failures along the way, 786 was officially launched in August 2017. Q: What inspired the colors of the nail polish? The colors of the nail polish were all inspired by Muslim cities or cities with Islamic history. Granada was named after the lavender flowers of the Alhambra Palace, Fez was named for the turquoise tilework of Moroccan artwork, and so on. The names were chosen this way to represent and appeal to Muslims around the world, as the focus of 786 has always been to be a global brand. In January 2018, Ibrahim’s sister, Sana Ali, officially joined the company as the distribution and finance manager and is leading the efforts in global distribution. Over the course of the last 6 months, 786 Cosmetics has grown to add another 5 employees to the team. 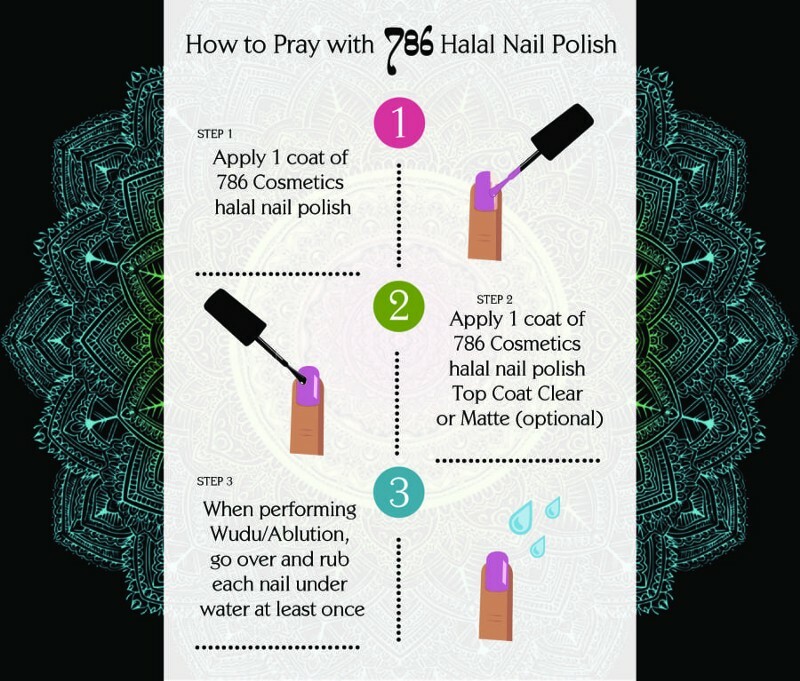 Q: How can nail polish be halal? 786 Cosmetics does not produce ordinary nail polish. Our industry-leading revolutionary formula is water permeable. Which means water can penetrate through our nail polish allowing you to perform Wudu and pray without having to remove it. Our formula took years of research and development. Every aspect has been perfected. Contrary to popular belief being water permeable does not make our nail polish chip and peel easily. Actually quite the opposite, unlike other nail polishes our non-peelable formula lasts anywhere from 7 to 10 days with just one coat. 786 has also been tested & verified as 100% Halal & Wudu Friendly by Kalamazoo Islamic Center (KIC). Q: What is the science behind water permeable nail polish? In theory, if oxygen can permeate a film then hydrogen attached to oxygen can also travel with the oxygen, therefore, enabling water to transfer from one side of the film to the other ie the film is “breathable”. By demonstrating that oxygen can transfer from one side of the film to the other in a diffusion chamber under laboratory conditions, then the theory is satisfied. Experimentally, a nail polish film sample is put inside a diffusion chamber separating the two halves of the chamber. Oxygen flows into the top of the chamber and an oxygen-free carrier gas (ie nitrogen that will bind oxygen if it is available) flows into the other half on the other side of the film. The experiment is carried out according to ASTM D 3985 and ISO 15105–2 standards. (These exacting standards have far greater technical relevance than any coffee filter paper test). As oxygen molecules travel through the film and bind to the carrier gas, the concentration of the combined gases can be measured allowing for the calculation of an Oxygen Transmission Rate (OTR). The OTR measures how much oxygen (cm3) can move through a certain film area (m2) per day iecm3/m2/day. To apply this measure to a film, the measure used in this OTR x micron of thickness of the film or cm/m2/day.um. 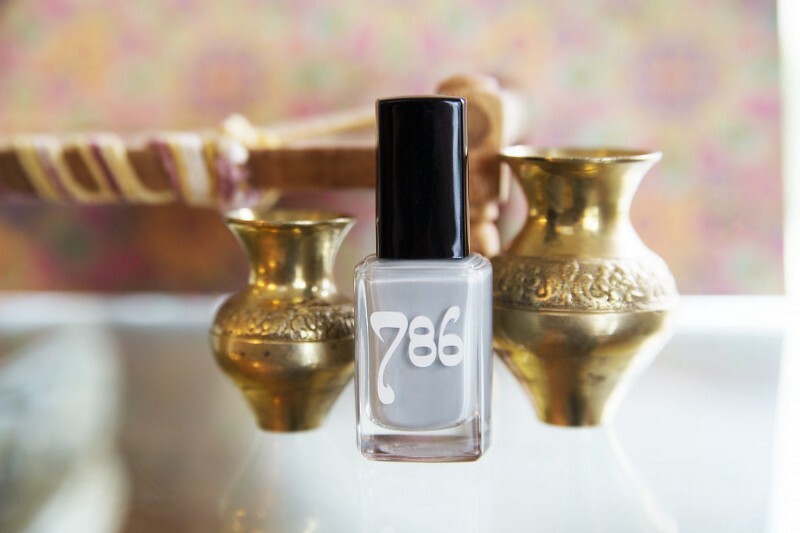 786 is a nail polish brand, and we plan to stick to that industry. We do plan on bringing more variety and include mini options, specialized gift boxes, and tons more colors. Q: Why did you set up the product? Halal cosmetics is a growing industry, but there are still so many gaps. Many times these companies are unable to provide beyond their country of origin. We at 786 want to make our products accessible to Muslims around the world who are looking for a way to be a part of the fashion and makeup industry without compromising their religious beliefs in doing so. The response from our customers has been overwhelming. We are based in Illinois, USA and we used to be excited about orders coming in from Canada. Now we see orders coming in from all Muslim majority countries as well as places like Mauritius, Tanzania, and Trinidad. Q: What has been the main factor in your company’s growth? We ask for feedback and ideas from our customers and they have been a huge factor in our growth. We’ve had many people specifically buy colors based on their names, and have even suggested new colors and cities for us to include. Even at just 17 colors currently, we have been told by our customers that our color options, our formula, and our brand is why they choose us over our competitors. We have recently added a NEW Soy-Based Nail Polish Remover to our line of products. This product gently removes nail polish while moisturizing the nails, because it is free of acetone! We look forward to expanding and seeing what the future holds for 786 Cosmetics. To view 786 Cosmetics website, click here. Originally published at The Muslim Vibe.